This article specifically covers AppleWorks 5, but the process for version 6 should be quite similar from what I have seen, and it also works for ClarisWorks 4, which, after all, is the same program as AppleWorks 5. It may also apply to earlier versions, but they have not been tested. When you paste a PICT file you have copied from another program into AppleWorks, it can enter the word processor file as either an inline graphic or a floating graphic. An inline graphic behaves just as a giant letter of a tremendous font would. A floating graphic can cover up what is behind it, or text can be made to float around it. The key is to use the tools that appear on the left side of a word processor document. 1. Copy the graphic you want to paste to the clipboard (Cmd-C or Copy in the File menu). 3. 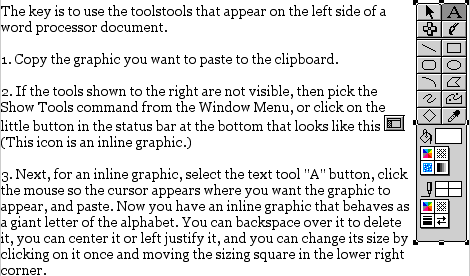 Next, for an inline graphic, select the text tool “A” button, click the mouse so the cursor appears where you want the graphic to appear, and paste (Cmd-V or Paste in the File menu). Now you have an inline graphic that behaves as a giant letter of the alphabet. You can backspace over it to delete it, you can center it or left justify it, and you can change its size by clicking on it once and moving the sizing square in the lower right corner. Inline graphic in AppleWorks 6 running in OS X 10.6 Snow Leopard. 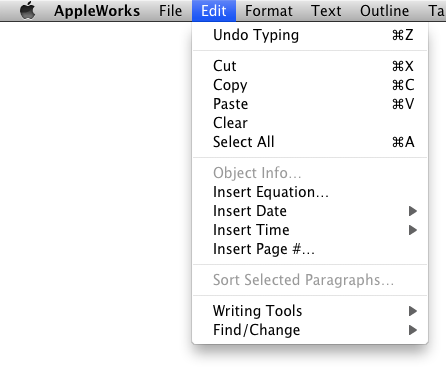 You can insert a graphic as an object in AppleWorks and then make text flow around it. Text can flow around an object. 4. 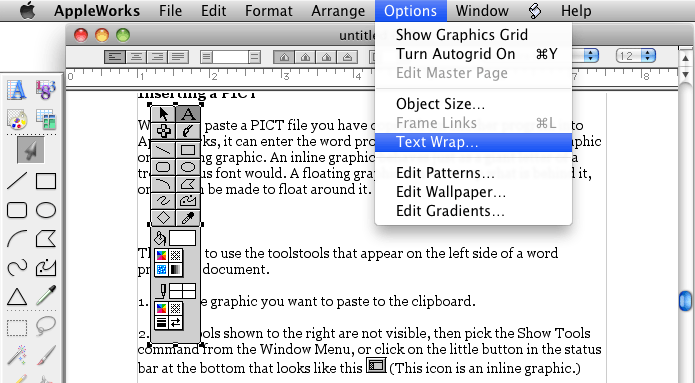 To insert a graphic as an object, click the object tool (arrow button) on the tools and then paste your graphic. The graphic may appear on top of the letters you are typing. To make the letters wrap around the graphic, make sure the graphic is selected and then pick Text Wrap from the Options menu. Select anything except the default, and the text will wrap around the picture like an illustration on a web page. Resize the graphic in the same fashion. This gives a much more professional look to your document and allows you to fit more information in less space. Next, when pasting tab-delimited text into a word processor, you can take two approaches.
. Drag the tab down to the ruler at the top of the document and release it where you want the decimal points to align. 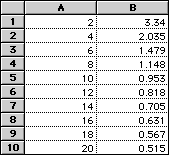 In the case where you have many pages of repeating data to display, you may want to insert a section break above and below the table, then use the column tool to make the data appear in two or more columns. Data will flow from the first column to the second and so on. The column tool is right next to the decimal tab button. on the tool bar to draw a box approximately the right size, then paste into cell A1. Then you can adjust the table to show exactly the data you have. 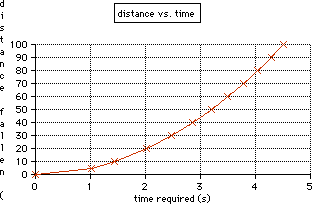 If you typed the data in or want to display it a different way than the original program, this method has the advantage of allowing you to make a chart in the usual fashion and control its appearance using AppleWorks instead of using the bitmapped PICT you get by copying and pasting to the clipboard. The AppleWorks charts are object-oriented and will look better when printed. Keep looking for future advanced AppleWorks tips in future Mac Lab Reports. Go to Using Logger Pro for Experiments.